The world's first cordless braking grinder stops accessories in under 2 seconds, delivers the power of a corded grinder, and has up to 10X longer tool life. The M18 FUEL 4-1/2 inch / 5 inch Grinder supplies maximum sustained power to complete the toughest grinding, surface preparation and cutting applications. The POWERSTATE Brushless Motor provides up to 10X longer motor life and lower cost of ownership. The grinder features REDLINK PLUS Intelligence, the most advanced system of cordless power tool electronics, for maximum performance. A Rapid Stop Brake feature stops accessories in under 2 seconds. The 18-volt lithium-ion grinders thin body design gives it optimized balance to rest easily in your hands. Tool-free accessory changes using the FIXTEC nut and guard adjustments mean less downtime during work. The grinder is built with the same tool body, gearing system and anti-vibration side handle as Milwaukees legendary high-performance corded grinders for maximum durability on the job. The 2893-22CX M18 2-Tool Combo Kit includes the 1/2 inch Brushless Hammer Drill Driver (2902-20) and the 1/4 inch Hex Compact Brushless Impact Driver (2850-20). The M18 Cordless System's patented technologies and electronics, innovative motor design, and superior ergonomics provide the most efficient blend of power, weight and performance in the industry. The M18 Brushless Hammer Drill/Driver is the Most powerful drill in its class at 725 inch/lbs. of torque. The M18 1/4 inch Hex Compact Brushless Impact Driver has the fastest application speed its class and delivers 1,600 inch/lbs. of torque. 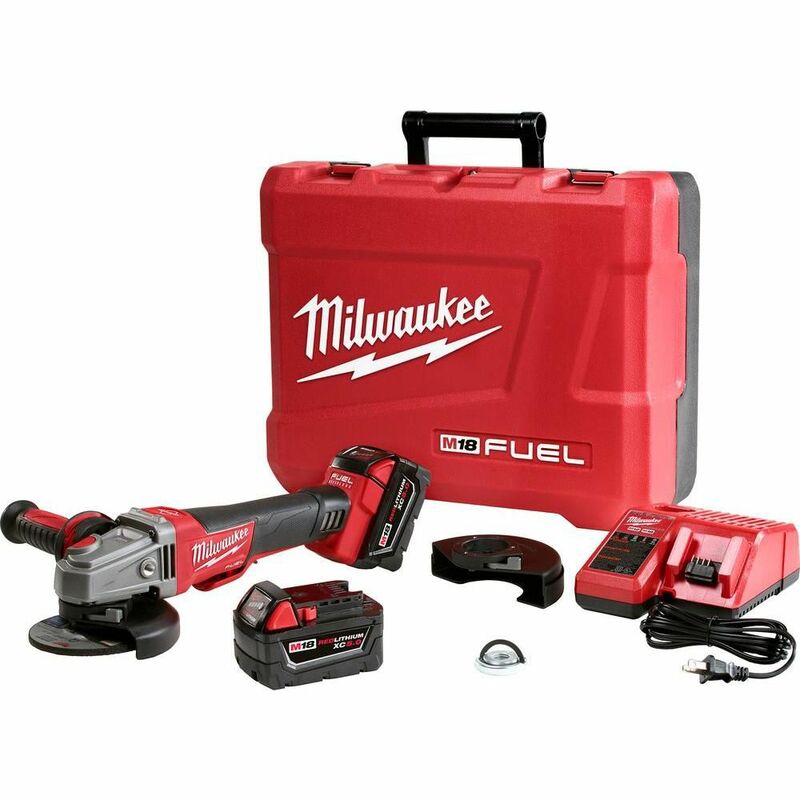 Both tools feature Milwaukee built brushless motors, REDLINK Electronics, and REDLITHIUM batteries that provide more efficient power delivery, for fewer trips to the charger. The 2695-25P M18 Cordless 5-Tool Combo Kit includes 2607-20 M18 hammer drill driver; 2656-20 M18 impact driver; 2625-20 M18 hackzall; 2650-20 M18 6-1/2-inch circular saw; 2735-20 LED work light; (2) 48-11-1828 M18 REDLITHIUM XC battery pack; 48-59-1812 multi-voltage charger; contractor bag; (1) general purpose sawzall blade and (1) 24-tooth circular saw blade. The M18 Cordless Lithium-Ion System's patented technologies and electronics, innovative motor design, and superior ergonomics provide the most efficient blend of power, weight and performance in the industry. Powered by RED LITHIUM the M18 cordless system delivers more torque, more power, and longer run-time than the competition. This Milwaukee M18 cordless lithium-ion six-piece combo kit includes the 1/2-inch Hammer Drill / Driver (2602-20), 1/4-inch Hex Impact Driver (2650-20), SAWZALL Reciprocating Saw (2620-20), 6 1/2-inch Circular Saw (2630-20), 4 1/2-inch Cut-off / Grinder (2680-20), Work Light (49-24-0171), (2) 3.0 Ah batteries, charger and carrying case. The M18 Cordless Lithium-ion System's patented technologies and electronics, innovative motor design, and superior ergonomics provide the most efficient blend of power, weight, and performance in the industry. Powered by REDLITHIUM, the M18 cordless system delivers more torque, more power, and longer runtime than the competition. The M18 FUEL Blower has the power to clear from 15 ft, generates up to 30% less noise than gas, and provides the longest, max CFM run-time. Designed to meet landscape maintenance professional needs, the POWERSTATE Brushless Motor and REDLITHIUM HIGH DEMAND 9.0 Battery provide the best combination of power and run-time. The blower features a variable speed trigger for increased control. The ambidextrous cruise control allows the blower to be set to a desired power output, so the operating hand can be relaxed reducing fatigue. The M18 FUEL Blower is fully compatible with 125+ solutions on the M18 system. M18 FUEL 18V Lithium-Ion Brushless Cordless 4-1/2 in./5in. Braking Grinder Kit w/ (2)5.0Ah Batteries The world's first cordless braking grinder stops accessories in under 2 seconds, delivers the power of a corded grinder, and has up to 10X longer tool life. The M18 FUEL 4-1/2 inch / 5 inch Grinder supplies maximum sustained power to complete the toughest grinding, surface preparation and cutting applications. The POWERSTATE Brushless Motor provides up to 10X longer motor life and lower cost of ownership. The grinder features REDLINK PLUS Intelligence, the most advanced system of cordless power tool electronics, for maximum performance. A Rapid Stop Brake feature stops accessories in under 2 seconds. The 18-volt lithium-ion grinders thin body design gives it optimized balance to rest easily in your hands. Tool-free accessory changes using the FIXTEC nut and guard adjustments mean less downtime during work. The grinder is built with the same tool body, gearing system and anti-vibration side handle as Milwaukees legendary high-performance corded grinders for maximum durability on the job. M18 FUEL 18V Lithium-Ion Brushless Cordless 4-1/2 in./5in. Braking Grinder Kit w/ (2)5.0Ah Batteries is rated 4.7 out of 5 by 13. Rated 5 out of 5 by RK from My son bought this and an impact wrench for his... My son bought this and an impact wrench for his maintenance job at a quarry. Harsh environment, but these powerful tools do great for him. He's super happy with the purchase. Rated 2 out of 5 by chino from I really liked this grinder. The only reason I am giving it 2 stars is because it would constantl... I really liked this grinder. The only reason I am giving it 2 stars is because it would constantly shut off. If you would pull the trigger and let it go right away it would shut down after doing this about 10 times in a row. I would be grinding spots off metal beams, not being hard on the grinder. I would walk along 40 foot beams and hit any imperfections really fast and every few minutes it would turn off. I would have to wait about a minute before it would start up again. I was using new fully charged batteries and the grinder was not overheating. This has happened to 3 new different grinders. I was told by one store that it was a safety so the grinder wouldn't overheat. I find it hard to believe because I have tried a co workers and it never shut down. I guess Milwaukee just made a bad batch. Rated 5 out of 5 by milwaukeemike from Milwaukee grinder This tool is awesome, great quality from the best tool manufacturer.